From using warty toads and shaved chickens to cure the Bubonic Plague to putting dried smallpox scabs up noses to create immunity, a fascinating family show underway in Dundee is exploring some of the weirdest medical myths and mysteries over the ages. 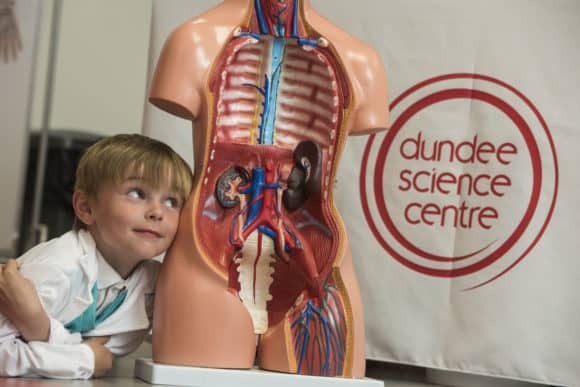 Complementing Dundee Science Centre’s new Medical Marvels exhibition, which opened exactly one month ago, the ‘Medical Myths and Mysteries’ show is wowing audiences with unsavoury (but true) tales of how doctors used to deal with the sick, compared to kinder, modern day methods. The show also lifts the lid on some real and fake diseases throughout history and allows younger visitors to dress up as surgeons and try out keyhole surgery on a realistic model who has consumed too many jelly sweets! There’s also the chance to use shields and a leaf blower to deflect ping pong ball ‘germs’. The show runs regularly throughout the day and is included as part of normal admission. Recognising the past, present and future of medical science, visitors to Medical Marvels can delve into the world of medicine – from trying out virtual surgery on interactive torsos to identifying their own veins with a laser vein finder and testing real-life techniques used in medical training. For more information, telephone (01382) 228800 or visit www.dundeesciencecentre.org.uk.